Change is the only thing that is constant in life. Whilst life is full of small changes, we sometimes experience big changes that bring major stress, pain, and even heartache. These kind of events are often hard to deal with. But with mobile storage, there is always a solution to lessen and overcome such things. Well, there are a lot of things that could happen in which we could not prepare ahead of time, at least not completely. And many of this painful life events happen at a moment’s notice. One moment you’re enjoying your life, then all of a sudden, you are now facing many important decisions that need your attention. Hence, a mobile storage is a great option you could resource to lean on during tough times. Here’s how it could be a great solution when these things come. Losing someone you love is hard and unbearable. And the thought of not seeing them again is even more painful. Well, let’s face it, most of us haven’t planned for it, for who knows it would happen, eh? But then, all of a sudden, you have all the items from their estate and there’s no place to store them until the estate is settled. Yes, this could be true especially if that loved one of yours rented or was in a retirement or nursing home. However, renting a mobile storage unit is an affordable option that is available. Storing their possessions in a modular storage unit will keep everything safe until all the other immediate needs are taken care of first. What will happen to a storage unit if the renter/ tenant dies? Well, just because they pass away, that doesn’t mean their right pass away with them. Even if you have the keys to get into their unit, you still need to obtain some legal papers to access it. Note that the management can’t unlock the unit for anyone not unless they have an official death certificate or court letter. What about the leasing obligations after the death of a tenant? Settling an estate in a court could take well over a month, meaning the rent will still need to be paid on the storage unit that time. Management can eventually auction off the contents if the rent is not paid or if no family member comes to claim the unit. And if the family member decides to take out the possessions out of the unit, then they can close the contract. Dealing with the death of a loved one is quite painful. It requires a lot of responsibility. Thus, give yourself time to grieve and take care of your emotional needs while you go about legalities and taking care of funeral arrangements. 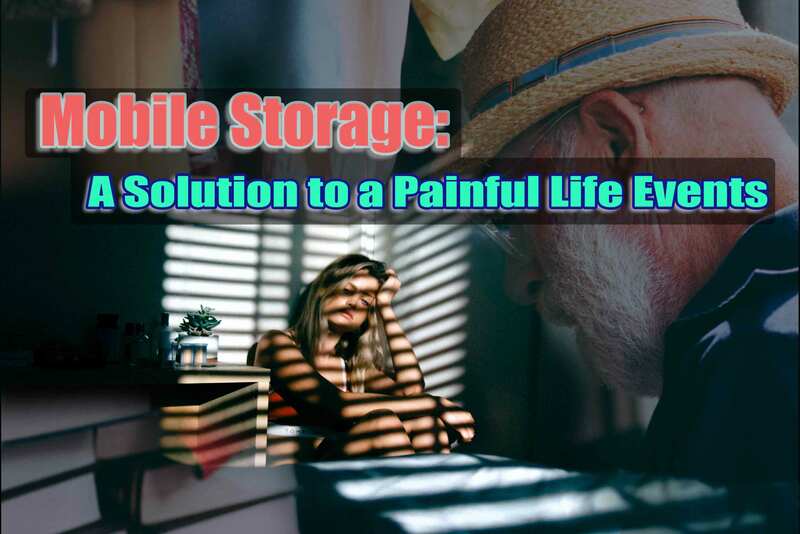 Likewise, renting a mobile storage is a great way to take some of your stress off your shoulders during this tough time. When starting a relationship, no one plans for a break-up or even get a divorce, right? But then, it’s a fact that many relationships end this way. And when this happens, you are suddenly facing a change of living arrangements. Well, this applies when both couples are living together. One or both of you will be moving out to your home or apartment. And once both of you decides to end the relationship, having a mobile storage unit is a quick and easy way to move your things from your home into a safe and secure place until you figure out your next step to move on. Well, here are some of the reasons why you might need to invest in one during a divorce or break-up. Fresh Start. Start your life after separation with a clean attack. You don’t have to take with you all your stuff as you start your new life. Put away the items you no longer want in a storage unit until you’re ready to get rid of it. Moving from your previous home together with the removals of all your stuff could be a major hassle. So, avoid moving everything multiple times by stacking it all in a unit. Unexpected things in life could really throw you a curveball. What you need to do is to prepare and know your options. Always remember that when in doubt, get a storage unit. After all, renting one could give you stability during times of uncertainty and sudden big changes in life. Likewise, having a safe and secure self storage to put your possessions could make death and divorce less stressful. Macy’s Mobile Self Storage is what you are looking for. Call us today and talk with our friendly customer service for more details. Learn about the different services we have and see which one fits your need. Also, if you need a quick and short means of storage, then you might be interested with our previous article. Read Common Uses of Short Term Self Storage: A Solution to a Temporary Space Need. This entry was posted in Storage and tagged cheap storage, Macy's Mobile Self Storage, self storage, self storage sydney, Storage, storage module, storage sydney.